When I was scripting this video, I tried to take myself back… back when I didn’t know anything about Korean Beauty; the brands, the products, the categories, etc. 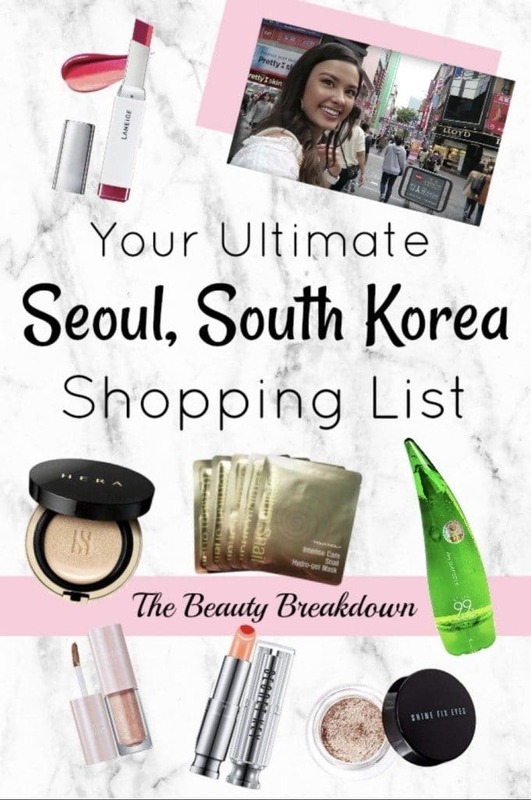 I wanted to do this from the perspective of someone who just wants a list of what they should buy when going to Seoul, South Korea. So these are products that I think are generally liked by most and are recognized as great products! Obviously, feel free to pick up this entire list or just a couple products that stand out to you! Now before I get started, I would like to note that due to the globalization and popularity of Korean Beauty, finding these products online is a lot easier nowadays. So if you don’t have the opportunity to visit Korea, I’ve linked all the products below in this post. Of course, buying them in-person would be a little bit cheaper.. but you can still snag some great products either way! Did you know every single cushion foundation is manufactured in Korea? That’s right! Even western-brand ones! That’s because Korea owns the specific rights to manufacture cushions. If you want to pick up something that’s specifically Korean, definitely try a cushion foundation! Some of my favorites include the Laneige BB Cushion Pore Blur, the Missha The Original Tension Pact Perfect Cover, the Hera Black Cushion, and the Hera UV Mist Cover Cushion. This one might seem a little odd. I mean, can’t you get aloe vera gels everywhere? While that’s true, I have an absolute affinity for Korean aloe gels. They’re always light weight on the skin, freshly-scented, affordable, and great for a multitude of uses! The original aloe vera gel that made headlines years ago was the Nature Republic Aloe Vera Soothing Gel. Since it’s initial success, several other Korean road shops have come out with their own versions of aloe vera gels. Some other awesome options are the Holika Holika 99% Aloe Soothing Gel and the Benton Aloe Propolis Soothing Gel (this one even contains a little honey for added benefits!). Before I got into Korean Beauty, I had never heard of an essence. That’s because an essence is a skincare category that is unique to Korean skincare! An essence is a somewhat concentrated, water-y textured product that you pat into your skin. Since the formula is a bit thinner, it’s fast absorbing and rushes lot of amazing ingredients into your skin (hello, fermented ingredients!). The classic essence and one of my personal long-time favorites is the Missha Time Revolution The First Treatment Essence. I also love the IOPE Bio Essence Intensive Conditioning Treatment and the CosRX Hyaluronic Acid Hydra Power Essence. Korean makeup is all about the glitter nowadays! Since this is all the rage on the streets of Seoul, you of course, should try some glitter-y eyeshadows. There are a lot to pick from and a lot of different formulas, so I picked a couple different kinds for you. Of course, there’s the classic Aritaum Shine Fix Eyes. These gorgeous little pots are highly pigmented and ultra shimmery… there’s a reason I have more than 15 shades of these! Some of you might prefer liquid glitter formulas so if that’s the case, the Holika Holika Eye Metal Glitters and Peripera Sugar Twinkle Liquid Shadows are excellent. I’d even say they’re more affordable dupes of the oh-so-famous Stila ones! I used to hate sunscreens and sun creams. They always felt heavy and sticky and left a white mask on my skin! Korean sun creams are not like this at all! They’re comfortable on the skin, sit great under makeup, don’t feel heavy, and rub in nicely. I will never go back to non-Korean sun creams! They’re seriously the best. Some of my favorites include the Etude House Sunprise Must Daily Lotion, the Innisfree Perfect UV Protection Triple Care Cream, and the CosRX Aloe Soothing Sun Cream. Korea knocks it out of the park when it comes to nail art. I’ve had my nails done once in Korea and boy, was it an experience and did my nails look amazing! However, maybe you don’t have the budget (my nail art cost 150,000 won or $150 USD) or you’d rather do them yourself… you can pick up some nails stickers, nail strips, or nail gems at any Korean road shop! My all-time favorite are these Dashing Diva ones. They are super easy to apply, wrinkle-free, and last for 2 weeks (seriously!). You heard me! Snail products are the bomb.com. I have fallen in love with snail skincare because it really does work wonders for the skin! The idea behind using snail slime/mucus in skincare products is that it has regenerative and healing properties. Therefore, it’s helpful for those who have acne-prone skin or skin that is need of some healing! I love snail products because it helps keep my skin healthy. Mizon is a leader when it comes to snail skincare. I particularly love their Mizon All in One Snail Repair Cream and their Snail Repair Intensive Ampoule. If you’re looking to try a snail sheet mask, the Tony Moly Intense Care Snail Hydro-Gel Mask. You might have heard of the gradient lip look and how popular it is in Korea. While it’s been around as a makeup trend for a while, it’s still prevalent and in style. The traditional way of doing a gradient lip is with a lip tint. The Etude House Dear Darling Water Gel Tint is a nice tint because it’s a slightly thicker formula so it’s easier to work with. The Peripera Peri’s Ink Original Tint comes in a wide variety of shades and has also been around for quite some time. I know it’s really popular among Korean girls! They also have a matte formula, the Peripera Ink the Velvet, is you’re more into that. However, if you’re like me and have a hard time working with lip tints (I get the stain everywhere!) you can purchase products that are designed to give you the gradient lip look in one swipe! The first company to come out with these type of lip products and by far the most popular are the Laniege Two Tone Lip Bars. For a more affordable option, there’s the Secret Key Sweet Glam Two Tone Glow. This is another skincare category that was invented and popularized in Korea. Sleeping masks (or packs) are something you use at the end of your skincare routine to seal in the moisture of your skin and help it heal and regenerate overnight. It’s actually one of my favorite types of products and it really helps my skin recover. One of the original sleeping masks is the Laneige Water Sleeping Mask. This has been one of my all-time favorite skincare products for years! My skin always looks and feels amazing after I use this. I also have been loving the Make Pr:em Peel Me Radiance Peeling Sleeping Pack! This is something I totally forgot to mention in this video, but had the full-intention of talking about it! Sheet masks are super popular and you cannot leave Korea without picking up a couple. They’re super affordable (or pricey depending on what you choose!) and pretty much every Korean Beauty company makes them. There are a lot to pick from and to be honest, there really isn’t such a thing as a bad sheet mask… at least in my experience. However, I do have some personal favorites of course! I love Leaders Sheet Masks and have for years.Dear Klairs and Papa Recipe also make great quality sheet masks! Anyways, I hope this clarifies what to pick up when you’re in Korea! Let me know down below what your must-buys are.. looking forward to hearing back!